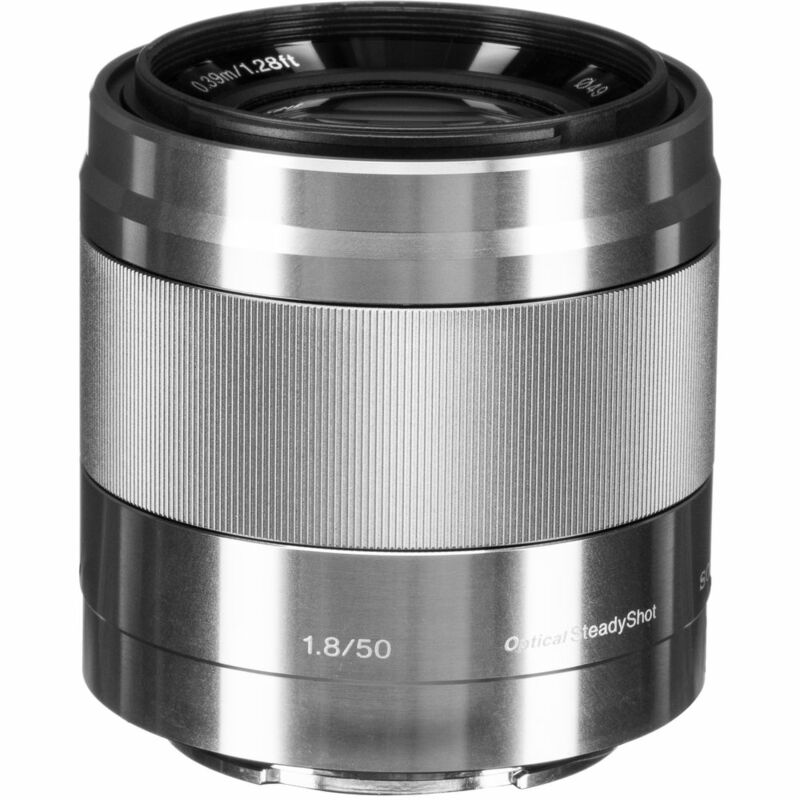 Enjoy a near perfect portrait-length perspective on your APS-C E-mount camera with this silver E 50mm f/1.8 OSS Lens from Sony, which provides a 75mm equivalent focal length. It's fast f/1.8 maximum aperture and seven-blade circular diaphragm help create beautiful images by allowing users to use selective focus techniques with the shallow depth of field. On top of this, the lens is equipped with Optical SteadyShot image stabilization for reducing the impact of camera shake. Also, it has an internal focus mechanism for fast, responsive AF and reaching a minimum focus distance of 1.3'. Box Dimensions (LxWxH) 4.8 x 3.9 x 3.7"
E 50mm f/1.8 OSS Lens (Silver) is rated 4.8 out of 5 by 298. Rated 4 out of 5 by David from Love The Image Quality, Hate the Durability I really want to give this lens a 5 star. The quality of portraits I get out of it are as good as even my pro lenses. I bought it for my Sony 6300. I wanted a light outfit for my on location jobs. It worked great until I put it in my bag next to a heavier lend. After that job I noticed a few dents in the thin metal casing of the 50mm f1.8. Also the black paint on the focus ring is wearing off from normal use, after just a few months. I will continue to use this lens until I wear it out. Then I will use my legacy glass until I can afford to buy the Zeiss 55. Buy it for quality, but keep it in some type of a protective covering if you want it to last. Rated 5 out of 5 by Ethan from E 50mm f/1.8 OSS Lens (Black) I purchased this lens about 3 weeks ago and I have not taken it off my camera yet. This is a PERFECT portrait lens for my Sony a6000. This lens is fast and it provides super creamy bokeh that makes background blur and subject separation virtually seamless. After a few weeks of much research and consideration between the 50mm & the 35mm, I settled for this beauty! This lens has exceeded all of my expectations. The speed, the picture quality, the build. Because of this lens I purchased my own studio lights and I am indulging in the world of portrait photography. This is a MUST HAVE in your arsenal. 10/10 RECOMMEND! Rated 5 out of 5 by Anonymous from Great lens for the price I'm a beginning photographer looking to expand my lens arsenal. So far I've been very happy with the lens' performance. Super crisp shots, great bokeh, fast focusing and going down to 1.8 really allows you to shoot well in low light. I'm shooting it on an a6000 and really have been very happy with the shots I'm getting on it. Since it's a crop sensor lens, the 50 is really like a 75 so it's tough shooting indoors where you can't back up a lot to get the shot you might need. But that's really my only complaint, and that's not really anything to do with the lens, just a heads up. Very happy with the purchase. Rated 5 out of 5 by Gerald from The Dark Horse of NEX Lenses The combination of price, image quality, build, smoothness and image stabilization makes this lens a great buy. It takes some getting used to the 75mm equivalent focal length but after using for awhile, I'd say this lens is great for street photography. The lens is acceptably sharp wide open but with smooth bokeh and a little bit of purple fringing. However, when stopped down to f4-f8, the edge to edge sharpness/detail is excellent with no or minimal CA and very minimal distortion. Although the autofocus speed is acceptable, it is smooth and the optical image stabilization is very effective which makes it great for video use. The only two things I wish this lens had is a closer focusing distance and if it came in black. Rated 5 out of 5 by Matthew from Built solidly, great optical performance Just any other fast fifty out there, this lens doesn't disappoint. When paired with the NEX-7 the results are simply outstanding. Perfectly usable wide open, sharp at f/2, and even more-so at f/2.8. Paired with the effective OSS (about 2 stops shutter speed advantage most of the time), and you can simulate the exposures an f/1.2 lens would give you very reliably, subject movement not-with-standing.The focus ring is large, smooth, and is dampened perfectly, making manually focusing easy and accurate. The build quality, similar to other e-mount lenses, is top notch, it feels like a very dense lens.At only $ this is a lens any NEX owner should have in their kit. Rated 5 out of 5 by homerc67 from Stunning lens at a stunning bargain. What more could you want from this price tag? Stabilization-check, Bokeh-check, low light-check, metal housing-check, decent focusing ring-check, included hood-check. Say what you want about e-mount lenses but who else can offer this feature set at this price? Certainly not Canon or Nikon. In all honesty this is the third time I've owned this lens, every time thinking I would find something better but the simple fact is the value of this lens is too good not to own one. Are there better lenses? Certainly, but there is no other lens in my bag that I can pull out and think to myself, how in the heck does this not cost more? This is by far the smartest lens to own for e-mount. Rated 5 out of 5 by jayhawksean from Terrific Value! This is the lens I most looked forward to obtaining. It has not let me down. I have this lens on my camera more than any other lens. Prior to getting this lens, I purchased a Canon FD 50/1.4 and then the Canon FDn 50/1.4 to use with an adapter on my Sony NEX-5N. I think the SEL 50/1.8 is as sharp as the Canons. I tested center and corner sharpness. I also think the SEL 50/1.8 has pretty good bokeh; that is, pleasant out of focus blur in the foreground and background away from the center of focus. I highly recommend this lens.